I beat the utility company at their own game. They offer a “free nights” package. I combined that package with my solar panels, which provide most of my electricity during the day, and cut my electricity bill in half! Can you do that too? Let’s see. The first major project we undertook on our homestead was adding solar electricity. That was 5 years ago. Before adding solar we had lots of assumptions and little real-world knowledge. Here is what we learned. Stupid question? Not really if you look at it from a homesteader’s perspective. Your homestead really only does one thing. It converts space and sunlight into useful products. Vegetables, graze for animals that make meat, milk, or eggs, and fruit trees are different examples of this process. Solar electricity is just one more way to convert sunlight into a useful product. The basic components are solar panels, mounting fixtures, wire, and an inverter. That’s it! There is nothing magical or complicated about it. I designed and installed my 3,500-watt solar power system myself. Compare this to a chicken coop which combines building, fencing, feeders, waters, chickens, and feed into eggs. Just like you learned how to raise chickens, anyone can learn how to install solar panels. The real question is this: Is Solar Electricity Worth It (the Cost)? The question of costs versus benefits is another story entirely. It really depends on what you are trying to accomplish, how much cash you can spend now, and how much value you will get later. If you are trying to live completely “off-grid” then you will need to have a much larger solar array than would be required if you are just trying to supplement your electricity and save on your bill. A solar power system for a home that is not connected to a utility provider must be much larger than one that is connected, and would require very expensive batteries that have to be replaced every 7 years. Tesla is coming out with some new batteries, but they are expensive. This article will not cover an “off-grid” system except to say they are expensive and require regular maintenance. Most people who install solar are trying to save money on their electricity bill. It is very possible to achieve this goal without buying a single solar panel. Before I installed my solar panels I cut my electric bill by half through using window units instead of central ac, changing to an instant hot water propane system, and installing a large wood burning stove for winter heat. Lots of electricity is simply wasted each month. Go to LED light bulbs, zone ac, and non-electric sources of heat. That’s a great start. Every dollar in electricity you don’t use is a dollar you save. After cutting all the waste and even spending some money on things like a more efficient water heater, we turned our thoughts to creating our own electricity. That’s where solar power comes into play. That depends on how much you are paying. If you live in a very expensive state for electricity solar will save more than if you live someplace where electricity sells for 5 cents per kWh… that means kiloWatt hour. Some might not know the lingo. Kilowatt Hours (kWh) is how many THOUSANDS of watts you use in one hour. That’s important. It will come up again later. We installed a 3,500 watt (or 3.5 kW) solar array on our homestead. That means the maximum it can generate is 3.5 kilowatts per hour. If the sun shines brightly enough to keep it at full power for 7 hours then I will make a maximum of 24.5 kWh in a day. My system generates about 21 kWh per day. If every bit of that power kept me from buying power from the grid, and my electricity rate was 10 cents per kWh, then I would save a maximum of $2.10 per day. That’s right! $2.10. About the price of a bottle of nice water at the local convenience store, or a Grande coffee from Starbucks. If the sun doesn’t shine that day then I save nothing. Partly cloudy = partly saving. My average Summertime savings per month is $40. Why didn’t I put in a larger solar array? 3,500 watts is fairly small. Why not put in a nice, big 10,000 watt unit? Wouldn’t that save me almost 3x as much, $120 per month. No. Some Solar Saves Money, Too Much Solar Means You Have to Sell the Excess Back to the Utility Provider. It turns out that we only use about 20 kWh of electricity during the part of the day when the sun is shining. We installed a system that only matches our daytime use. We did not install a system that would generate Extra electricity to sell back to the local service provider. Why not? Break-even analysis. Utilities generally buy electricity back at a reduced rate – about 50%. There are endless variations on how this might occur, but we will use that as an example. If my electricity costs me 10 cents per kWh, and I off-set (meaning don’t use) 21 kWh per day, then I save $2.10. If, however, I have a solar array that is twice as big as I need (42 kWh per day) and sell back the extra 21 kWh at 5 cents per kWh, then I only make $1.05 for the portion I sell back. Let’s do some math. If I spend $3,500 installing a 3,500 watt system that saves me $40 per month, then the system will break-even in 7.3 years. After that it will make a profit. If, however, I add an additional 3,500 watts to sell back, then it will take 14.6 years for that additional cost to be paid off, because I’m only getting paid half price for electricity I sell back. How did I win? I signed up for a “Free Nights” electricity plan that charges 15 cents per kWh, but doesn’t charge between the hours of 9 pm and 5 am. The sun is full strength in Texas by 8 am in the Summer, and blazes until 6 pm. That means I am only paying for electricity between 5 am and 9 am, then between 6 pm and 9 pm. That’s 7 hours. Other than that my electricity is either free because it’s solar or free because it’s free (“Free Nights”). Is that convoluted? YES!! That is how you should think about solar electricity. Convoluted. It is a resource that has both benefits and costs. It is not a magic wand. To complete the example above. If I use 1,000 kWh of electricity per month (which is about what we use on average) or 33 kWh per day, and that electricity is spread evenly throughout the 24 hour day, then I use about 1.4 kilowatts of electricity per hour. I will say that bluntly. Our homestead uses 1.4 kilowatts of electricity per hour. Solar covers that during the hours of 8 am to 6 pm. Free nights covers it from 9 pm to 5 am. That leaves 7 hours of electricity use TIMES 1.4 kWh TIMES 15 cents per kWh. The result is $1.47 per day TIMES 30 days = $44.10 per month in billed electricity use (if the sun shined every day, which it doesn’t). Whew! That was a lot of math. I’ll save the details on the next one. Without the solar and paying 10 cents per kWh the same electricity would cost $100. So I’m saving a maximum of $56 per month. Throw in rainy and cloudy days and we get to the average of $40 per month that my solar array saves me on my bill. Why is That Worth the Trouble? Why would anyone go to all that trouble to save just $40 per month. First $40 per month is almost $500 per year. How many eggs would I have to sell to make $500 in a year in PROFIT, not just sales? How much goat milk? Etc? I don’t have to feed my solar panels or milk them. They simply take up a little space. About the same space as a chicken coop and yard. Next, solar panels last at least 20 years. How much did electricity cost 20 years ago? How much will electricity cost 20 years from now? 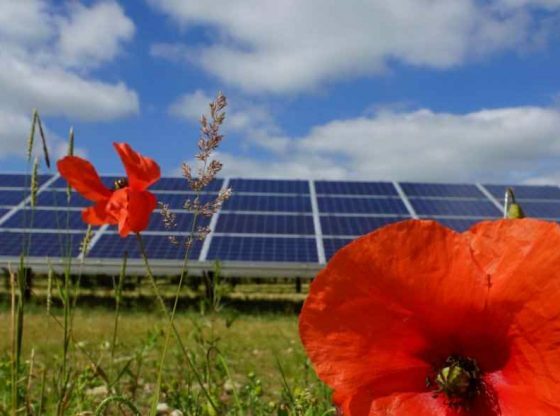 Installing solar is a way of spending TODAY’S money in order to save money today and even more money tomorrow after inflation makes electricity more expensive. Finally, my solar electricity system gives me the ability to have “some” electricity in the event of a total power outage by the electric company. This is because I bought an inverter (Sunnyboy brand) that has a special power outage bypass circuit. In my case I can turn on a “blackout” plug in my house that provides 1,200 watts of electricity as long as the sun is shining on my solar panels. This is great for running fans, satellite TV, laptop and charging our cell phones during the day. Once the sun goes down we have to use a generator or candles during a blackout. Laws, utility regulations, building codes… assuming they are the same as here, then you too can have solar. Here’s how. First, if you just make a single phone call to a solar installer and say “I want a solar electricity package” they will be happy to come out and sell you one at full price plus installation. My system costs about $3,500 to install myself. If I called someone else it would be closer to $7,000. Then instead of taking 7.3 years to pay for itself, it would take 14.6 years. Install it yourself if you can. What do you need? Buy a book, visit websites. The first website I recommend is the one for SunnyBoy Inverters. They have a great site and I highly recommend their inverters. I use one because they have that magic “blackout” circuit. Most inverters don’t. What’s an inverter? It’s the thing that turns solar electricity into usable electricity. You will need Solar Panels. I buy mine from Craigslist. 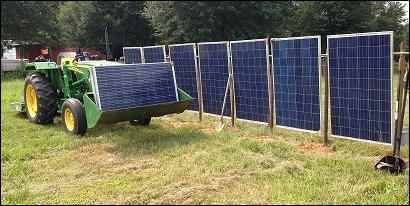 New panels on Craigslist in Houston or Dallas are going for $175 each for 305 watt solar panels. If you set up a system like mine with 3,500 watts of panels, that is 12 panels. 12x$175=$2,100. You will need an Inverter. If you have someone do it for you I think it will cost twice that much, but I haven’t called any installers lately. Maybe it will only cost $5,000. I certainly hope not! The solar panels that are generally used for grid-tie systems like this run at 36 volts per panel. They will all be combined (12 of them) to make about 432 volts going through the wire. That’s enough to kill you! That’s why there are breakers on each end. I installed my panels on a cloudy day, so they wouldn’t be making much electricity. I wore rubber gloves, so I couldn’t get shocked. And I didn’t install the breakers or fuses until I was sure it was all connected property. If you can install a ceiling fan without electrocuting yourself, then you can probably do this as well. It is more complicated, but it still just one step at a time. The solar panels have two wires, each with a special plug. The plugs make them safe to handle and ensure you cannot plug them into each other incorrectly. It’s pretty idiot-proof. The inverter comes with instructions. If you have ever connected a wire to a breaker box and fuse then you can probably understand the instructions. I just followed the instructions. SunnyBoy also has an 800 technical number that I called when I had a question. Easy! Technically installing the inverter yourself might void the warranty, but warranty-schmarranty. We’re homesteaders. We don’t need no stinking warranty! 3,000 watts of solar panels. Do your own math. How much does electricity cost? How much will it cost in the future? I want to install things on my homestead today when I’m making money that will help me in 20 years when I am living on savings and Social Security. To me it’s a form of savings through infrastructure. My homestead is paid off. So I have no mortgage. I decided to cut my electricity use from 2,000 kWh per month to 1,000 kWh per month by becoming more energy efficient first. Then I spent $3,500 to install solar which cut my remaining bill from about $100 per month to $55 per month. Solar is a part of my homesteading plan, not the entire plan. Only you can decide what elements fit into your homestead plan.